We often talk about the one difficulty when cold smoking food at home – and that is ensuring that your food has dried sufficiently to make sure it is safe to eat. If you weigh your food before you brine it – to ensure it is dry enough to eat – fish should have lost 20% of its weight and meat should have lost at least 25% of its weight. 2) you can find some way of air-drying it either by putting it under a fan or even putting it in a fan assisted oven WITHOUT any heat! Last weekend was such a time at Smoky Jo’s. I had salted a small side of salmon for about 6 hours and then cold smoked it for 12 hours. When I came to test it – it was not dried sufficiently, so off I went to put it in my home-made air dryer – an old fridge with a blade fan from an ‘expel air’ in the bottom. To my horror the fan did not work. Despite my efforts in changing the fuse and checking the wires I still could not get it to work. 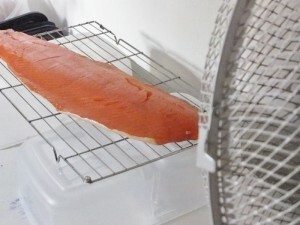 In the end I simply put the salmon on top of my chest freezer on a rack and angled a simple desk fan at it. The air flowed over the salmon and within 3 hours it was ready to eat! So simple!